Analysis of specific gene expression in single living cells may become an important technique for cell biology. So far, no method has been available to detect mRNA in living cells without killing or destroying them. We have developed here a novel method to examine gene expression of living cells using an atomic force microscope (AFM). AFM tip was inserted into living cells to extract mRNAs. The obtained mRNAs were analyzed with RT-PCR, nested PCR, and quantitative PCR. This method enabled us to examine time-dependent gene expression of single living cells without serious damage to the cells. The properties of individual cells depend on molecules that constitute them. The different combinations of protein expression result in structural and functional changes of individual cells. Although most of these events depend on differences in gene expression, no method is available to examine time dependent gene expression of individual living cells. There are other methods to analyze mRNA from single cells. For example, the cellular content may be aspirated into a fine capillary and mRNAs could be analyzed with PCR , differential display , or amplified antisense RNA procedure using T7 RNA polymerase . These techniques did not allow examining time dependent gene expression of individual living cells because their mRNA harvesting procedures resulted in partial or complete disruption of the cells. The goal of our study is a time dependent measurement of gene expression of a single living cell, as defined by mRNA expression. The change of gene expression in a single living cell may determine its uniqueness, function, and biochemical activities. We refer to this field as single cell biology and believe it will provide exciting new opportunities to better understand new biochemical processes of cell biology. Recent progress in the field of nanotechnology has enabled us to perform direct manipulations of biological material containing proteins [4–6], DNA molecules [7, 8], organelles and cells [9–13]. The AFM has been considered to be an important tool in the study of nanotechnology. Since its invention in 1986 by Binnig et al. , the AFM has been increasingly used in biological systems [15–21] because it can be operated in a liquid environment as well as under ambient conditions. The AFM has the ability not only to produce high-resolution images of biological samples, but also to manipulate the sample because the AFM tip makes direct contact with the sample surface with high positional accuracy. In this paper, we developed a method to examine mRNA expression of single living cells without severe damage to the cells. This method also can be applied to extracting other biomolecules as well as mRNA from living cells. 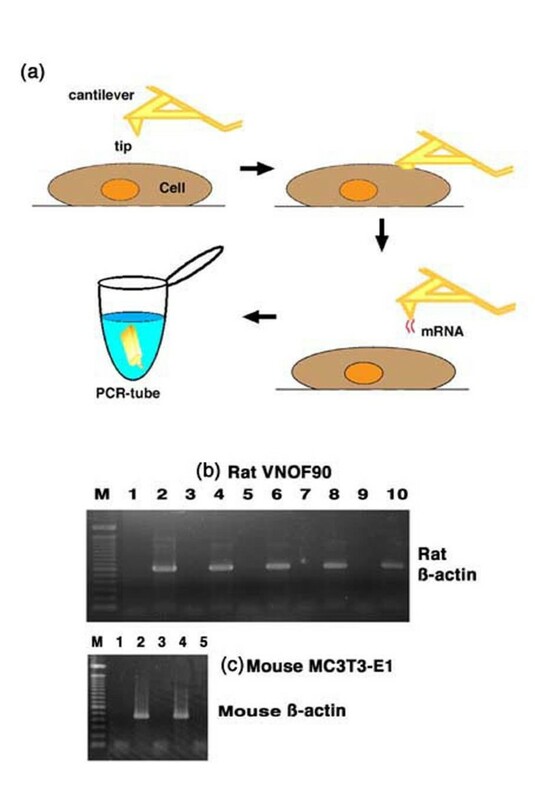 The β-actin mRNA expression of individual living cells was examined using rat fibroblast-like VNOf90 cells and mouse osteoblast-like MC3T3-E1 cells (Fig. 1a). Although β-actin mRNAs are usually distributed throughout the cytoplasm uniformly, they are localized to the leading edge of the cells when the cells start to migrate [22, 23]. Thus we chose the single cells surrounded by other cells that inhibit the migration of the target cells. PCR products for rat and mouse β-actin mRNAs were detected as shown in the even numbered lanes of Figs. 1b and 1c. In the negative control, PCR products were not detected without the insertion of the tip into the cell (odd numbered lanes in Figs. 1b and 1c). Experiments for the detection of β-actin mRNA and the negative control were performed alternately. Principal features of the experimental procedure. A target region of a cell on a Petri dish was positioned underneath the AFM tip through the observation of an inverted optical microscope combined with AFM (a). The AFM tip was then lowered onto the cell and inserted into it, and held for approximately 45 s to allow the tip to bind the cell ingredient containing mRNA with physical absorption. The tip was then lifted off the cell and placed into a PCR tube. To avoid the contamination of nucleic acid, all AFM instruments were treated with DNAZap (Ambion, TX, USA) and then washed with RNase free water extensively. β-actin mRNA expression of five rat VNOF90 cells (b) and two mouse MC3T3-E1 cells (c) was examined as shown in the even numbered lanes. In the negative control (odd numbered lanes), the tip was contacted with media without the insertion of it into the cell. The detection of β-actin mRNA from single VNOf90 cells. The procedure for inserting the tip into the cell was not successful. The PCR reaction was not successful. β-actin mRNA did not exist in the cell where the tip was inserted. The first two results were considered to be experimental errors, and the last one was considered to result from the probability of the existence of mRNA. Nevertheless, the high probability of detecting β-actin mRNA indicated that it could be used as a positive marker for examining the expression of other genes which would exclude the first two reasons from consideration. A population of mammalian cells grown in culture medium contains about one million mRNAs per cell. Fibroblast cells are reported to contain 2,000~3,000 copies of β-actin mRNA per cell . Our method can be applied to detect other mRNAs whose copies number more than several thousand per cell. To extract mRNA specifically or detect smaller numbers of mRNA, the use of AFM tips coupled with oligo(dT)n might be helpful. In the next experiment we tried to examine if our method could be used to determine more than one kind of gene at the same time. As shown in Fig. 2a, VNOf90 cells expressed fibronectin protein as well as β-actin. AFM tips inserted into the single living cells were placed into RT-PCR solution that contained primers for both β-actin and fibronectin. Five μl aliquots of the first PCR product were put into a second PCR solution containing β-actin or fibronectin primer sets. In total, we assayed 10 single living cells and the results of five single cells are shown in Fig. 2b. PCR products for both β-actin and fibronectin mRNAs were detected in all of the 10 different single cells. Detection of both β-actin and fibronectin mRNAs from single living cells. 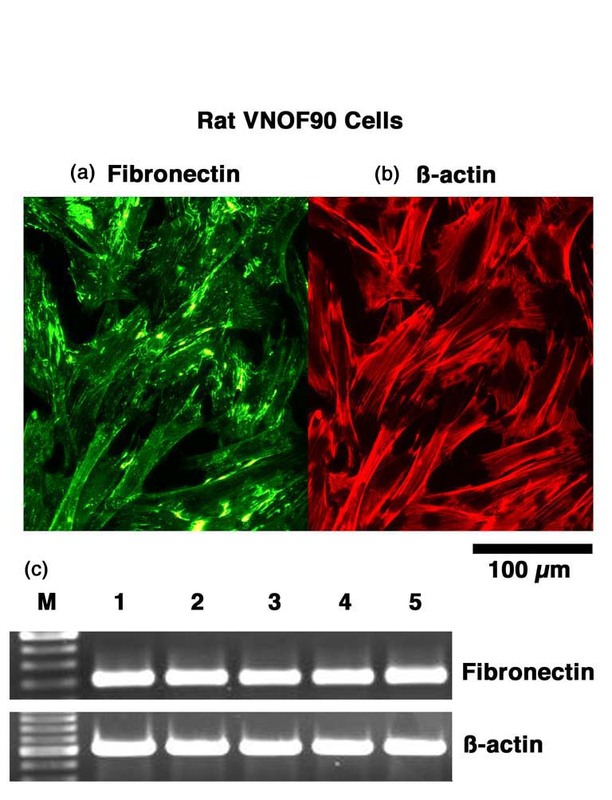 Immunocytochemistry demonstrated VNOf90 cells expressed both fibronectin (a) and β-actin (b). Both β-actin and fibronectin mRNAs were detected in all of the 5 different single cells (c). In order to examine time dependent gene expression of single living cells, the response of rat VNOF90 cells to serum has been used as a model for studying the changes in c-fos gene expression (Fig. 3a). In our study the cells were induced to enter a quiescent state with DMEM containing 0% FBS for 24 hours and then stimulated by addition of 10% FBS and 10 μg/ml cycloheximide (CHX) for 2 hours. CHX is well known to induce increases in c-fos mRNA expression level to prevent degradation of c-fos mRNA. The cell medium was then changed to DMEM containing no FBS and 10 μg/ml CHX for one hour. Finally, the cell medium was changed to DMEM containing 10 μg/ml CHX (Condition A) or no CHX (Condition B). Total RNA from confluent cells on 60 mm dishes at different times was extracted using the procedures of the RNA Isolation Kit (Gentra System, MN, USA). Quantification of mRNA was carried out with quantitative PCR. 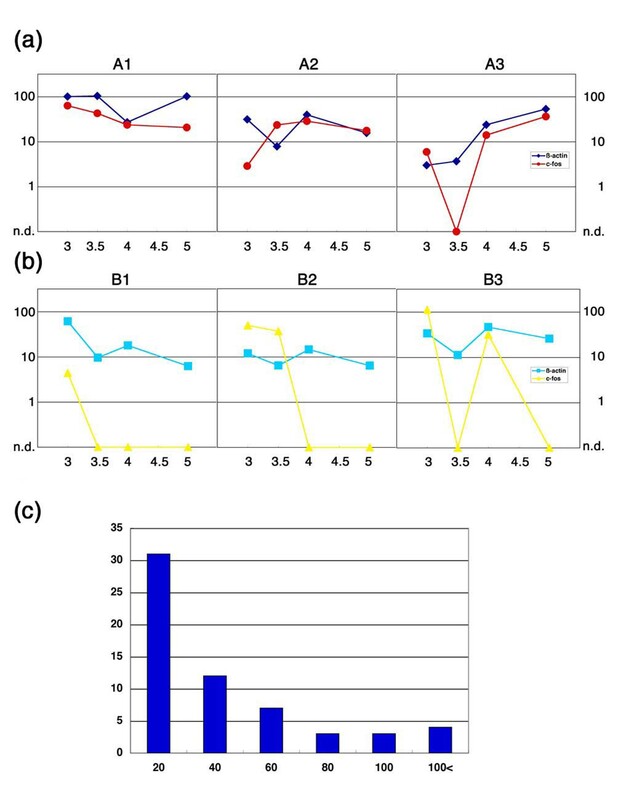 The β-actin mRNA levels were more constant than the c-fos mRNA levels in both A and B conditions (Fig. 3b). Although the c-fos mRNA levels decreased rapidly in the absence of CHX from 3 to 5 hours following stimulation, they decreased gradually in the presence of CHX from the cell population analysis. The detection of c-fos and β-actin mRNAs from single cells, termed A1, A2, and A3 cells (from condition A) was examined with our method (Fig. 4). The change of β-actin mRNA levels was also small compared with that of c-fos mRNA levels in single cell analysis as well as in the cell population analysis. Although the expression profile of c-fos mRNA in the A1 cell was very similar to the result obtained from the cell population analysis, the A2 and A3 cells showed different expression profiles. These results suggest that c-fos mRNA expression levels are not uniform among individual cells. 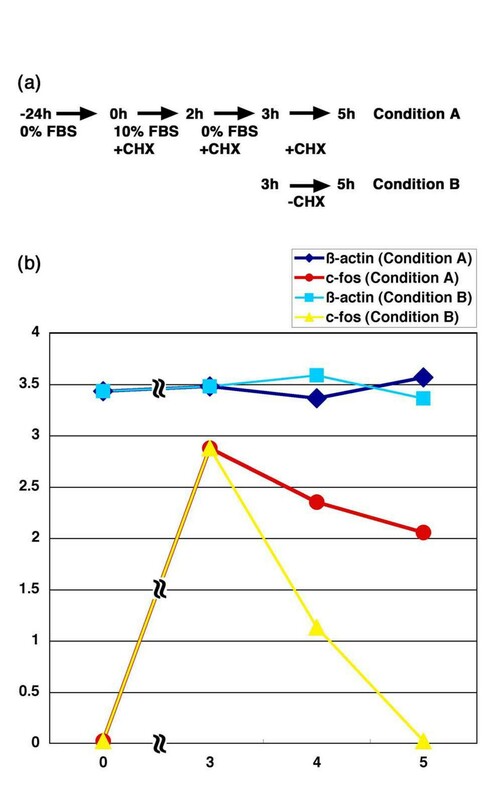 Although c-fos mRNA was not detected in the A3 cell at 3.5 h, β-actin mRNA was detected, indicating that the experimental errors were able to be eliminated. In condition B (B1, B2, and B3 cells), c-fos mRNA expression was not observed in any of the cases at 5 h following stimulation. This result corresponded to the result from the cell population analysis. The expression of c-fos mRNA in the B1 cell was observed only at 3 h. In the B2 cell, c-fos mRNA expression was detected at 3 h and at 3.5 h and not after 4 h. In the B3 cell, c-fos mRNA expression was detected at 3 h and not at 3.5 h, and then detected again at 4 h. This type of pattern was also observed in the A3 cell. These results indicate the possibility that the fluctuation of c-fos mRNA expression level occurs at the single cell level. Figure 4c shows the histogram of the number of β-actin mRNAs bound to AFM tips. In most cases, their number was equal to or less than 20. We performed nested PCR as well as quantitative PCR followed by RT-PCR to examine c-fos mRNA expression. When c-fos mRNA was not detected with quantitative PCR, the nested PCR product was not detected on agarose gels, either. The cell population analysis. The response of VNOf90 cells to serum and CHX was used as a model for studying time dependent gene expression (a). VNOF90 cells were induced to enter a quiescent state by serum deprivation for 24 hours and then stimulated by addition of DMEM containing 10% FBS and 10 μg/ml CHX. The addition of serum and CHX induced the changes in gene expression including c-fos mRNA. (b) Relative mRNA levels of the cell population were measured with quantitative RT-PCR. The ordinate represents a common logarithm of a relative initial mRNA quantity. The β-actin mRNA levels were constant in both A and B conditions. The c-fos mRNA levels in condition B decreased more rapid than those in condition A. The single cell analysis. Time dependent mRNA expression of single living cells was examined (a and b). The ordinate represents a common logarithm of initial mRNA copies. The nd on the ordinate indicates that the product was not detected with quantitative PCR. In this case, the PCR product was not detected with ethidium bromide-stained 1% agarose gel followed by nested PCR, either. The histogram shows the number of β-actin mRNAs detected with single cell assay (c). Quantitative PCR was performed with standard curves using DNA fragments from rat β-actin. We provide a powerful new technique to study gene expression in mammalian single cells. Our studies demonstrate that time dependent gene expression patterns in single cells are not always similar to those in large cell populations. At the single cell level, gene expression patterns sometimes fluctuate up and down. We expect that these phenomena will aid in the understanding of the properties of individual cells. Rat fibroblast-like VNOf90 cells derived from the vomeronasal organ  and mouse osteoblast-like MC3T3-E1 cells obtained from RIKEN GenBank were grown in 35 mm Petri dishes in Dulbecco's minimum essential medium (DMEM) supplemented with 100 U/mL penicillin, 100 μg/mL streptomycin, and 10% heat-inactivated fetal bovine serum (FBS). The cells were washed three times with DMEM lacking FBS and used for the AFM experiments. Manipulation of the AFM tip (NP, Digital Instruments, Santa Barbara, CA) was carried out using an atomic force microscope (NVB-100, Olympus, Inc.). The AFM tip was positioned above a target cell under an optical microscope. The AFM tip approached the cell surface using a step motor command of the AFM operation. The touch of the AFM tip on the cell surface was detected by the deflection signal of an AFM cantilever. More loading forces were applied to insert the AFM tip into the cell membrane. The AFM tip was inserted into the cytoplasm region around the nucleus to collect mRNA. After the AFM tips were inserted into the single cells, the tips were then placed into PCR tubes. VNOf90 cells were fixed in 3.7% formaldehyde for 15 min, washed three times with PBS and then incubated with primary antibodies to fibronectin (a) in PBS containing 0.1% Tween-20 and 10% FBS for 12 h was followed by three washes and incubation with FITC labeled secondary antibodies and rhodamin-phalloidin bound to actin filaments (b). After being washed three times with PBS, the cells were examined using fluorescent microscopy. RT-PCR was performed with a one step RT-PCR kit (Qiagen, Valencia, CA) according to the kit's instructions with 0.2 μM of each primer in a 50 μl reaction volume. The sequences of the PCR primer pairs (5' to 3') that were used are as follows: mouse β-actin, 5'-primer 5'-GTGGGCCGCTCTAGGCACCAA-3' and 3'-primer 5'-CTCTTTGATGTCACGCACGATTTC-3'; rat β-actin, 5'-primer 5'-TTGTAACCAACTGGGACGATATGG-3' and 3'-primer 5'-GATCTTGATCTTCATGGTGCTAGG-3'; rat fibronectin, 5'-primer 5'-CCCTCCATTTCTGAGTGGTC-3' and 3'-primer 5'-GACAGTGAGTCCTGTGGGGT-3'; and rat c-fos, 5'-primer 5'-ATGATGTTCTCGGGTT-3' and 3'-primer 5'-TCACAGGGCTAGCAGTGTGG-3'. First-strand cDNA synthesis was performed at 50°C for 30 min, at which time the reaction was heated to 95°C for 15 min to activate HotStrTaq DNA polymerase. The amplification reaction was carried out for 30 cycles, and each cycle consisted of 94°C for 45 s, 55°C for 45 s, and 72°C for 1 min, followed by a final 10 min elongation at 72°C. Nested PCR was carried out for 20 cycles, and each cycle consisted of 94°C for 45 s, 55°C for 45 s, and 72°C for 1 min, followed by a final 10 min elongation at 72°C. A 5 μl volume of the reaction product from the first round was transferred to 45 μl of a second round mix for the 2nd round. The sequences of the PCR primer pairs (5' to 3') that were used are as follows: mouse β-actin, 5'-primer 5'-GACTCCTATGTGGGTGACGAGG-3' and 3'-primer 5'-GGATCTTCATGAGGTAGTCCGTCA-3'; rat β-actin, 5'-primer 5'-AAGATTTGGCACCACACTTTCTAC-3' and 3'-primer 5'-ACACTTCATGATGGAATTGAATGT-3'; rat fibronectin, 5'-primer 5'-CCTTAAGCCTTCTGCTCTGG-3' and 3'-primer 5'-CGGCAAAAGAAAGCAGAACT-3'; and rat c-fos, 5'-primer 5'-AGAATCCGAAGGGAAAGGAA-3' and 3'-primer 5'-ATGATGCCGGAAACAAGAAG-3'. PCR products were visualized on ethidium bromide-stained 1% agarose gels and then photographed. Quantitative PCR was performed with an Applied Biosystems Prism 7000 sequence detection system. Reactions were performed in a 50 μl volume including 40 pg of total RNA and buffer included in the SYBR Green I RT-PCR Mastermix (Qiagen, CA, USA). PCR cycling conditions were 50°C for 30 min, 95°C for 15 min, and 40 cycles of 94°C for 15 s, 55°C for 30 s, and 72°C for 45 s. Amplification plots and predicted Ct values from the exponential phase of the PCR were analyzed with ABI Prism 7000 SDS software. A standard curve was generated by using total RNA from the cells at 3 h diluted at 4-fold intervals. All standard curves and sample assays were performed in quadruplicate to improve the accuracy of mRNA transcript detection. For single cell assay, quantitative PCR was performed with the SYBR Green I PCR Mastermix (Qiagen, CA, USA) according to the kit's instructions with 0.6 μM of each primer in a 50 μl reaction volume. A 1 μl volume of the reaction product from the first round was transferred to 49 μl of the second round mix for the 2nd round. The sequences of the PCR primer pairs (5' to 3') that were used are as follows: rat β-actin, 5'-primer 5'-GTAGCCATCCAGGCTGTGTT-3'and 3'-primer 5'-CCCTCATAGATGGGCACAGT-3'; and rat c-fos, 5'-primer 5'-AGAATCCGAAGGGAAAGGAA-3' and 3'-primer 5'-ATGATGCCGGAAACAAGAAG-3'. Standard curves were generated by using DNA fragments from rat β-actin (Toyobo, Osaka, Japan) and c-fos at 4-fold intervals. DNA fragments from rat c-fos were generated with RT-PCR as described previously and then isolated with Wizard SV Gel and PCR Clean-up System (Promega, WI, USA). The concentration of the product was determined with an absorbance at 260 nm. TO conceived of the study and drafted the manuscript. HU carried out PCR and AFM. HK carried out AFM. AI participated in the design of the study and coordination. All authors read and approved the final manuscript.